If you want to mount any 1/2x28 TPI threaded accessories on your SIG 1911 .22LR handgun, such as a suppressor, a flash hider, or a fake suppressor, this is the part that you need. This thread adapter easily replaces the factory barrel nut and provides the external male 1/2x28 thread. The SIG 1911 .22LR Thread Adapter is CNC manufactured to precision tolerances from solid steel rod in one CNC lathe operation to ensure exact thread alignment and are hot salt blued to match your SIG 1911 .22LR pistol. 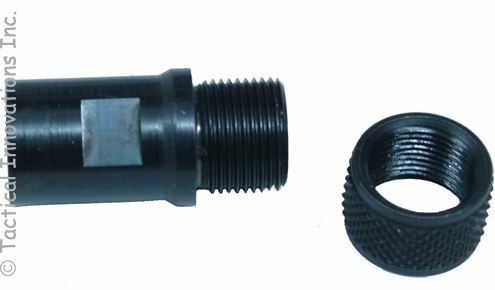 Each retail packaged adapter assembly consists of one adapter and one knurled OD thread protector.